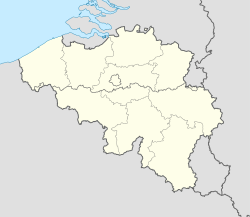 Kontich (Dutch pronunciation: [ˈkɔntɪx], old spelling: Contich) is a municipality located in the Belgian province of Antwerp. The municipality comprises the towns of Kontich proper and Waarloos. On December 31, 2010, Kontich had a total population of 20,584. The total area is 23.67 km³ which gives a population density of 866 inhabitants per km³. Kontich exists of three parts: Kontich Centrum, Waarloos and Kontich Kazerne. Kontich Kazerne has a big industrial center and a train station on the line between Antwerp and Mechelen. The barracks (kazerne in Dutch) which gave the name to the settlement have closed however. The Centrum part of Kontich has the town center. The E19 highway between Antwerp and Brussels passes through Kontich. "Kontich" comes from the Latin word condacum which means confluence of 2 streams. Pieter Serrien, historian and writer. Benedict Neefs, Abbot of Hemiksem.